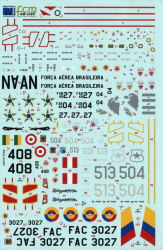 FCM Decals has an interesting line of aftermarket decals from Brazil. 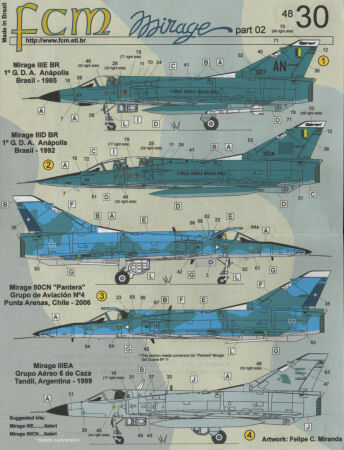 The subjects covered in this line include many Brazilian civil and military aircraft subjects, WWI aircraft, and the occasional look at the aircraft of other nations as well. 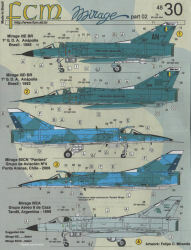 Over five years ago, FCM released Mirage Part I and provided a nice selection of subjects. The printing the FCM Decals line is sharp and clear, with the markings printed on a heavier carrier film that responds well to film softeners like Solvaset. The decal set includes complete stenciling, walkways, and warning markings. For a list of retailers that carry the FCM Decal series, look here. Thanks to FCM Decal for this review sample.